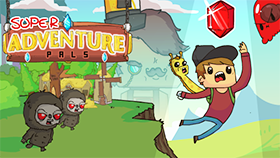 Crystal Story is an action-adventure game. It offers very interesting adventurous moments. A group of young people of a certain kingdom was planning to search for a crystal with extremely high magic ability, which could help their kingdom fight evil forces that invaded the Kingdom. The youth group will earn bonuses when completing tasks. The crystal was stolen by the witch Rita and hidden in the cave with many monsters. However, the map where they will go, there will be many demons protecting them and to find that precious crystal, they will have to cross the maze and fight hard with the monsters. There help them join Crystal Story, the game promises to be very interesting. In this exciting role-playing game, you will put your characters into very wide mazes and have many paths. However, thanks to the map in hand, appears on the upper right corner of the screen, but you will not be afraid of getting lost. In every location you move to, there will be demons of every level trying to attack you. You can choose 2 options, one is to approach and destroy them, the other is to avoid and find other areas. After defeating them, you will have the opportunity to receive gold coins or equipment weapons. In addition, many places will have chests inside that contain random treasures, try your luck.